Celebrate the turning of the seasons and the Return of the Light! 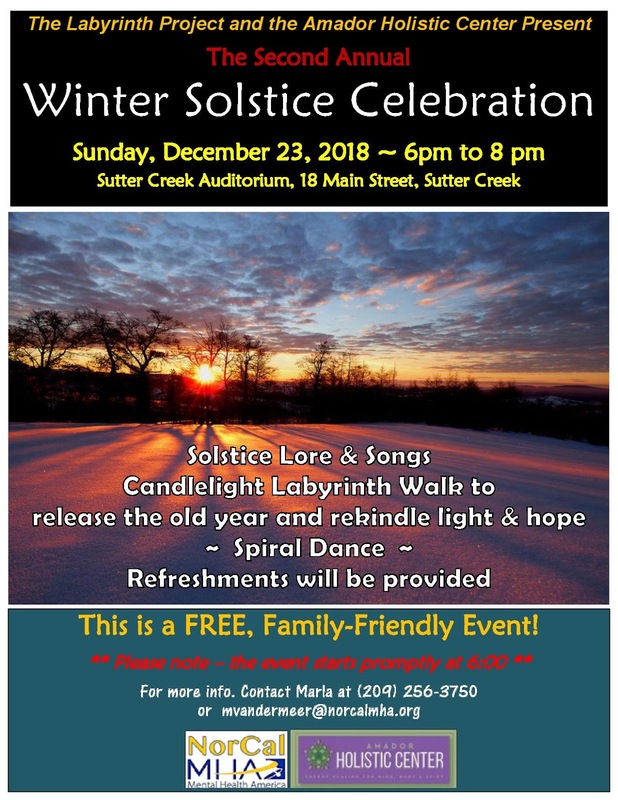 Join us for our second annual Winter Solstice Celebration. Sunday, December 23, 2018 from 6:00 p.m. to 8:00 p.m. in the Sutter Creek Auditorium, 18 Main Street, Sutter Creek. This is a FREE, Family-Friendly Event! Gather with us as we honor the sacred dark and celebrate the promise of the return of light and life. There will be stories and singing, a candlelight labyrinth walk and a spiral dance. Refreshments will also be available. Questions? Contact Marla at (209) 256-3750 or atmvandermeer@ norcalmha.org This gathering is brought to you by The Labyrinth Project and The Amador Holistic Center. ** Please be aware that this is not a “drop-in” event. The celebration will start promptly at 6:00 p.m. Doors open at 5:30. Advent has been my favorite season of the year since childhood. At my house, it was always a season of preparation and anticipation. There were the usual childhood questions "Are we there yet? Are we there yet? ", but those seemed to have managed by the sense of preparation, rather than a sense of "let's celebrate early". We weren't there yet. Preparations included the special projects of baking special foods, often given as presents to teachers and neighbours. Preparations included a table liturgy, where the whole family would join in lighting the Advent candles, singing an Advent hymn, and having a scripture reading preparing for the coming of Christ. The preparations helped with anticipation, both to make it stronger, and to make it more desirable. In a culture that promotes instant gratification, I appreciate that sense of preparation for delayed gratification more and more. I appreciate the intentionality of being present to the moment and aware of what is happening. It helps me to accept things the way they are, not as I would have them. It helps me to avoid forcing the holiday into my image of how it used to be or how I want it to be. My own preparations and disciplines have changed over the years. I retreat into the daily prayer offices with the antiphons, psalms, and readings as a way to prepare. I avoid the crowds at the shopping malls (well, I avoid them all year when I can), with the constant blaring of Christmas songs to try and set a mood that is not evident on most faces. I don't decorate until the fourth Sunday of Advent, to let Advent be full and then celebrate Christmas during the historic Christmas season from 25 December until the Epiphany at January 6. From my time in Africa some 30 years ago, I try to catch the live performance of the Festival of Lessons and Carols at King's College Cambridge, which is broadcast worldwide on the BBC. It marks the end of the college term for the students and faculty there, and is a good way to shift from Advent into Christmas for me. We will use those lessons and carols on the Sunday after Christmas at Trinity. All of which is to invite us all to slow down and pay attention. While most of us don't think of house cleaning as part of a celebration, the preparations are part of the celebration if we focus our minds on what is coming rather than the routine nature of the chore. I wish you all a prayerful Advent. and it will be no different. The cross is not God's B game. not conquering but asking for love. Christ lures us away from supremacy. to heal us of our resistance to love. Christ is homeless, a refugee, a migrant. Christ is black, queer, alien. is the limit of our love. than we see her and love her. and we keep missing it. -Dec. 1st, 9am-12pm is Advent Quiet Day in the church. -Dec. 1st at 12:30pm is a potluck holiday luncheon at Rollingwood Club House located off New York Ranch Rd. Bring a dish to share. 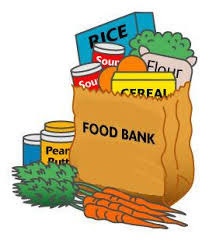 -Dec. 9th is Tuna Sunday- bring canned tuna to church in support of the food bank. -Dec. 12th at 11am- the sewing group will meet in Jane's Hall. -Dec. 13th at 5:30pm, The Rt. Rev. 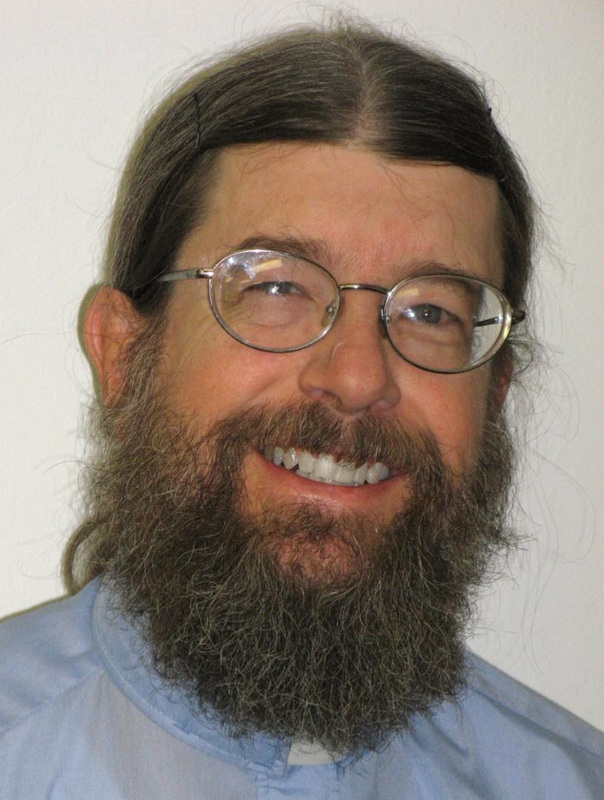 Barry Beisner will be visiting Trinity Church to install Fr. Paul Colbert as the Priest-In-Charge. -Dec. 15th at 6:30pm is the Parade of Lights in Sutter Creek. -Dec. 23rd at 9:30am we'll have a single church service for the Fourth Sunday of Advent. -Dec. 24th at 5:30pm will be the Christ Mass. -Dec. 30th at 10am we'll have a single church service for Lessons & Carols. -Book study continues this month, but due to Christmas and the Bishop's visit on Dec. 13, the group will only meet on the 6th of this month. Book study will resume on Jan. 10, 2019. As I sit to write this evening, I am overcome with gratitude. Advent is my favorite season in the liturgical year (although Lent is a close second) and I am feeling overwhelmingly grateful that I didn't miss it this year! "Miss it?" You may ask. "It hasn't even begun yet!" Therein lies my gratitude - this time between Thanksgiving and Advent; a time between no longer and not yet - has been the perfect period to take a breath and begin to prepare body, mind and Spirit for the season ahead. So many years I don't even recognize that Advent has begun as I rush, full speed into Christmas, forgetting to take the time to recognize the gifts that come from a slow and intentional Advent season. Usually it is over just as I begin to settle into a routine. A routine that helps me to step back from the hurriedness and to keep my eyes focused on what is coming. At a time in history when the world sometimes feels dark and it is easy to dismay, Advent invites us to peer into the darkness with the full knowledge that the light is headed our way. No matter what the year has held, the coming of the Christ child invites us to prepare for new life to be born. One of the routines I enjoy during Advent is to reflect on the past year. This offers an opportunity to look for and celebrate the transformation in my life. Where had there been darkness that has since turned to light? When had I felt dismay only to later recognize where God had been at work in my life? What new ideas, actions, or ministries are getting ready to be born my life? The invitation to prepare our hearts for the coming of the Christ child is an invitation to step back from the chaos that can sometimes come with the holidays and instead to prepare, intentionally, for our lives to be transformed. What if you knew God was going to be born in your life in just a few short weeks? What would you be doing to prepare? This is the time to begin! Serve your neighbor, open your heart, wait patiently, pray, allow yourself to be in stillness, and remember that the light always returns. 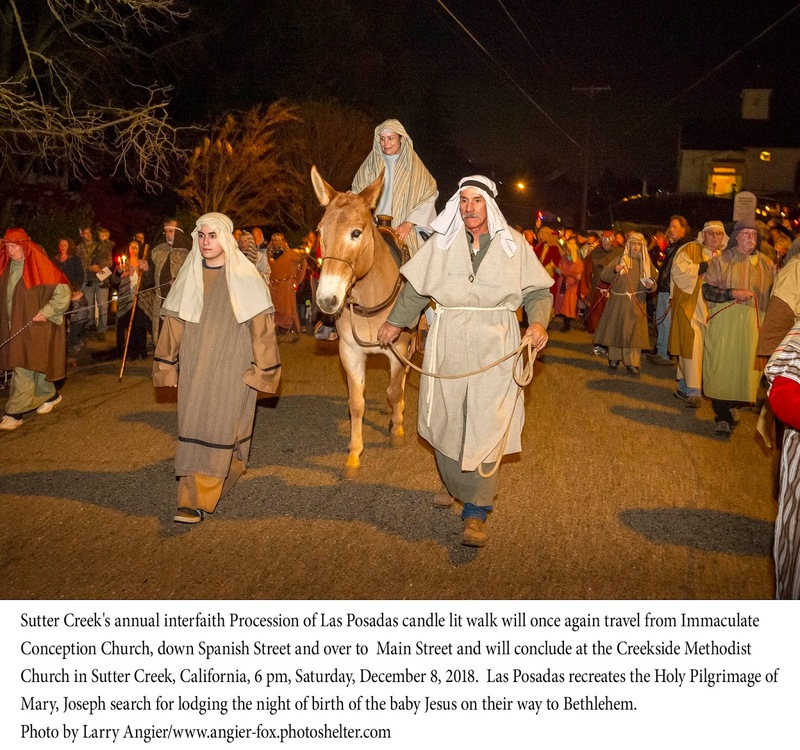 On Saturday, Dec. 8, the 13th annual Las Posadas will take place along the streets of Sutter Creek. It is a re-enactment of Mary and Joseph's search for shelter. Fr. Paul has agreed to give the opening welcome! Trinity has been asked to supply at least 4 shepherds, whose main job is providing atmosphere and a bit of gentle crowd control. Costumes are provided. We need a cookie co-ordinator who solicits 15 dozen homemade cookies from our congregation and delivers them to the Methodist Church. Also, we need a volunteer to help clean up the Methodist hall after refreshments are served, so that the church is ready for services the next day. Please tell Nancy Moore if you would like to help. in the turn of the seasons. circling to race back home to the sun. O God, grant me your sense of timing. 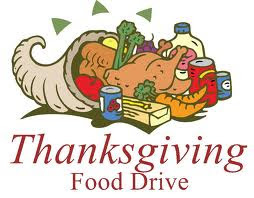 Food gifts for November totaled 56 pounds. The total for 2018 is at 1065 pounds. The following members of our church family are celebrating birthdays in December! 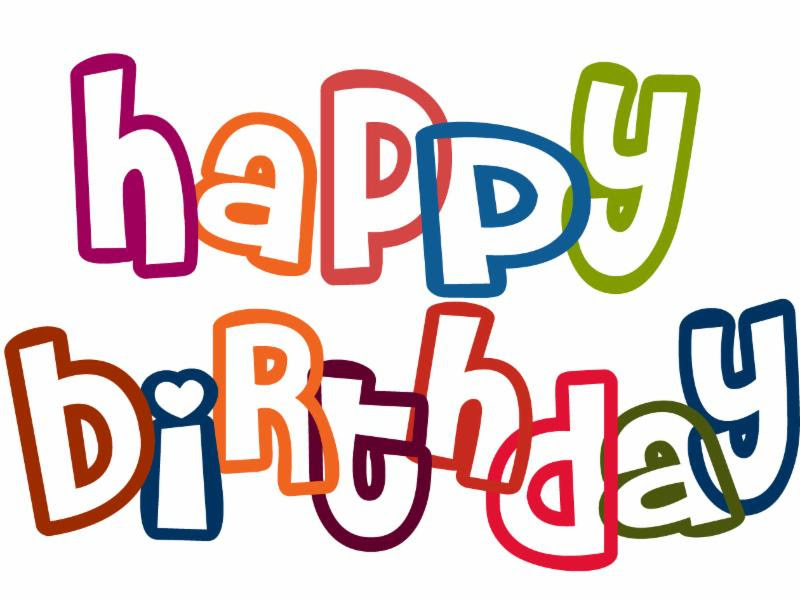 If you are celebrating a birthday in December, but you don't see your name listed here, please contact our Parish Administrative Asst. Mark Saturday, December 8, 6:00 p.m. on your calendar and plan to participate in the 12th annual Las Posadas Candlelight Walk in Sutter Creek! This event will take place no matter the weather. Las Posadas is a traditional re-enactment of Mary and Joseph’s search for a place to rest, complete with a narration of the Christmas story and the singing of traditional Christmas carols. Participants receive candles and programs at booths set up on Spanish Street near Immaculate Conception Church. Children are invited to dress as angels or shepherds. Picolina the mule carries Mary accompanied by Joseph and shepherds , followed by a choir and participants. 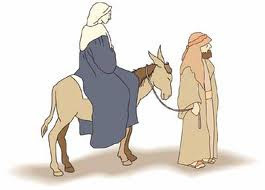 Along the way lighted by luminarias, Joseph seeks shelter for Mary- but is rejected by those answering his knock at their doors. The procession moves along Main Street, which has been closed to traffic. Finally, a stable in front of the Methodist Church provides a resting place. Then everyone is invited into the hall where warm beverages and homemade cookies are served, lovely music is being played, and people enjoy chatting with old friends and new. This is a beautiful, non-commercial way to begin the season of Advent, to enjoy the charm of the beautifully decorated city of Sutter Creek, and to be a part of this annual community event. Las Posadas is sponsored by the Episcopal, Methodist, and St. Katherine Drexel’s parishes. The Holidays are fast approaching including many of the events hosted throughout the foothills. This year's Las Posadas is Saturday, December 8 at 6:00 pm in Sutter Creek. Please accept this announcement as your invitation to join the Las Posadas choir chaired by Cheryl Parker. The choir will consist of two (2) groups: Those who wish to walk in the procession, and those who will meet us on the front stairs of Creekside Methodist Church at the end of the procession. For those of us who do not want to or are unable to walk in the procession, this is a great opportunity to join us at Creekside Methodist Church for the last several songs at the conclusion of Las Posadas. Additionally, please wear your church choir robe or plan to wear a Creekside Methodist Church robe. 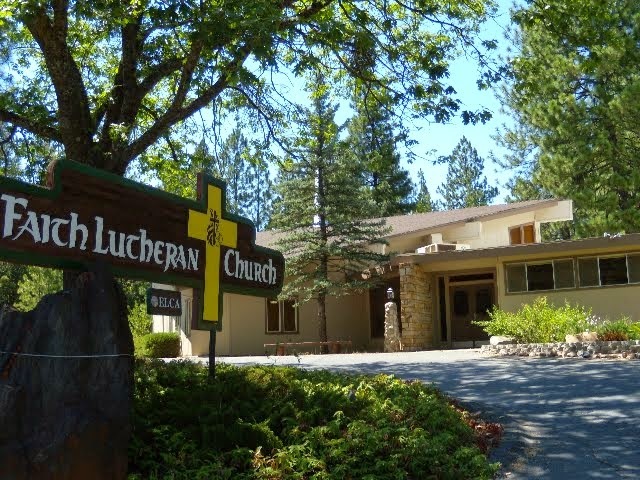 The procession is an interdenominational presentation hosted by the churches of Sutter Creek: St. Katherine Drexel Catholic Church, Creekside Methodist Church and Trinity Episcopal Church. Las Posadas is a Christmas candlelight parade with song. In 1580 AD St. John of the Cross with whom Las Posadas is attributed, led a community procession through the halls of the Carmelite Convent of Avila, Spain carrying images of Joseph and Mary. The Augustinian and Franciscan padres who came from Spain at the end of the 16th century to evangelize and teach the people of Mexico, adapted the pilgrimage for the commoners. The reenactment of Jesus' birth helped the converts experience the hope and promise that are a part of the Holiday season. If you are interested in participating in the Las Posadas choir where well know Christmas carols will be sung, please confirm your interest by emailing Cheryl at Cparker12510@gmail.com or calling (209) 273-9089. 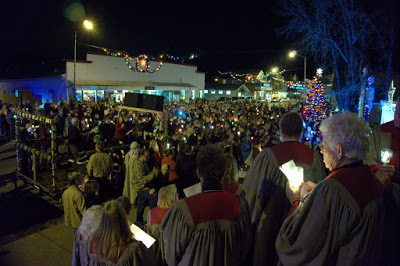 Choir members should meet on the day of Las Posada at the Catholic Church at the corner of Amelia and Spanish Street prior to the start of the possession. 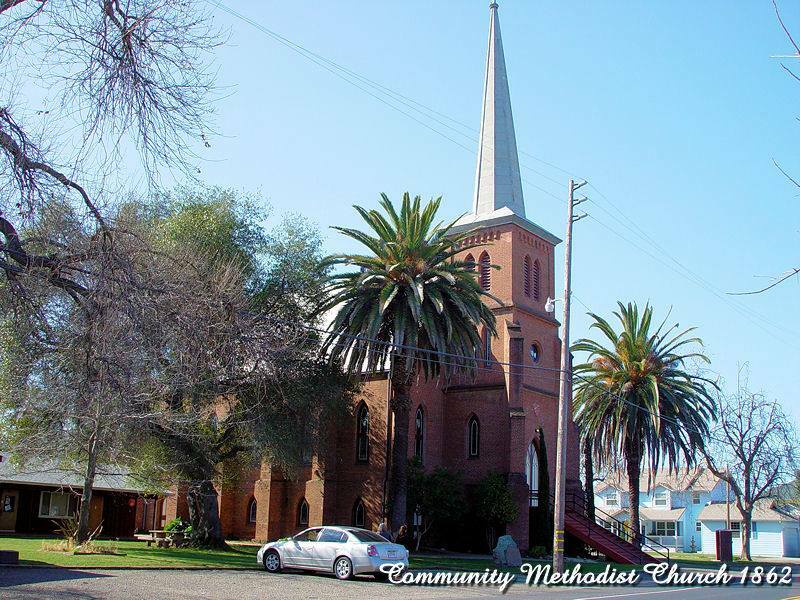 One choir practice may be scheduled prior to Las Posadas at Creekside Methodist Church where programs and choir robes as needed will be distributed. More details to follow as to the exact date and time of choir practice should one be needed. For those who wish to wear a Creekside Methodist Church choir robe, I will be at the church from 5:00 to 5:30 pm for robe and program distribution. At the conclusion of Las Posada choir robes can be returned at the church. If you would like to invite others to join the Las Posadas choir, kindly feel free to share this announcement.